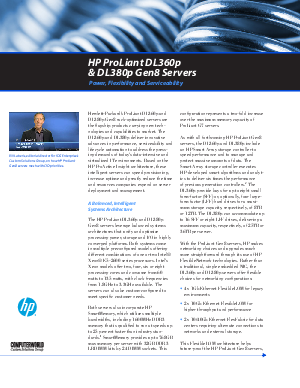 Explore the Power, Flexibility and Serviceability of the HP ProLiant DL360p and DL380p Gen8 Servers. The DL360p and DL380p deliver innovative advances in performance, serviceability and lifecycle automation to address the pressing demands of today's data-intensive and virtualized IT environments. Based on the HP ProActive Insight architecture, these intelligent servers can speed provisioning, increase uptime and greatly reduce the time and resources companies expend on server deployment and management.